To see if a site, company or supplier is registered, look for the site posters and banners. All registered organisations should display these prominently on the exterior of the site. They should also display one of these banners where it is clearly visible for anyone passing by. If you are having any problems with a registered site, company or supplier, please contact the administration office. The Scheme can only deal with issues directly related to the Code of Considerate Practice. The Scheme’s aim is to ensure that those who are registered are adhering to the Code of Considerate Practice. In the extreme case of non-compliance with the Code of Considerate Practice, registration may be withdrawn. To find out if the site, company or supplier in question is registered with the Considerate Constructors Scheme, visit the Scheme’s Construction Map where you will be able to search for registered works in your area. 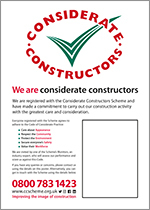 Alternatively, send the name of the company and the address/location to isasiteregistered@ccscheme.org.uk. To complain about construction activity registered with the Scheme, please email complaints@ccscheme.org.uk or call 0800 783 1423.